Or as low as $39.17 per month over 12 months. Apply Now. 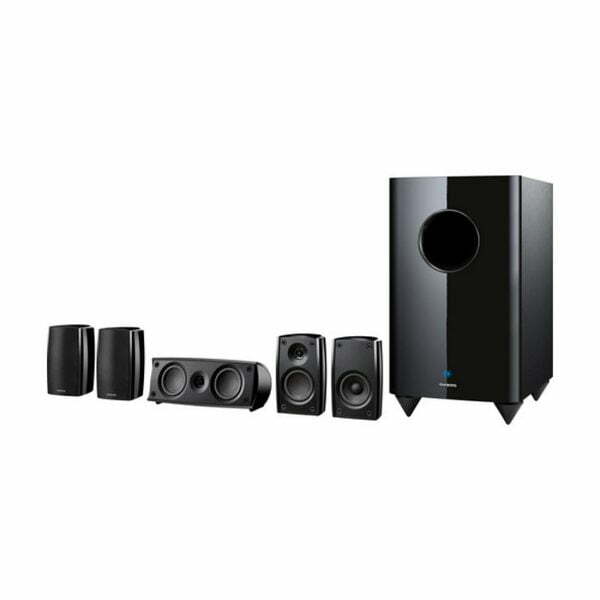 Onkyo SKS-HT690 5.1 Surround Sound Home Theater System from Onkyo provides realistic, immersive sound in a compact and affordable package. The system has an active sub-woofer with a 10″ down-firing driver. This design allows you to place the sub in a corner or near a wall without worrying about interference from the wall. The sub has a bass-reflex cabinet design, which helps to extend low frequency response and reduce compression. The front speakers each contain a 3.25″ woofer and a 1″ balanced dome tweeter, while the center speaker has a pair of 3.25″ woofers and a 1″ balanced dome tweeter. This provides a wide frequency response with excellent intelligibility for clear vocals, music, and sound effects. The rear speakers each have a 3.25″ woofer to provide full-range audio for detailed surround effects. Onkyo Canada 1 Year Limited Warranty.